A $2.02 frame from Goodwill. Big, plastic and brown with a faded print...oh the possibilities. and a little bit of white acrylic paint. ...and wait until tomorrow to see its transformation. I have been a busy woman this weekend and I’m excited to share that I have moved into new booth space at Queen of Hearts in Buford, GA. I adore my counter space at Vintage Village, Snellville, but have wanted to expand to a much larger location for some time now. I’m one of those sellers who has to “feel right” about the space. If it doesn’t talk to me, I cannot be convinced to take it. Last weekend, I grabbed my sister and took her to Queen of Hearts as she was looking for a new dining room set. While sis shopped, I was talking with a few of the dealers and before I knew it, they walked me over to a primo space with a great location and at a rent I couldn’t say no to. So, I signed the lease agreement, went to Home Depot and purchased paint to change the existing industrial green to a neutral coastal sand and I was off to the races. Still lots of room for my things. Have to find some old doors so I can build some door displays. I'm crazy for globes. Something about the muted blue of the sea maps calls me. I adore vintage clothing and have been collecting and wearing it for over 2 decades now. This Hugh Hefner type smoking robe is wonderful. Circa 1960s peignoir set in, smoking robe and a 1930s West Point Military Academy dress jacket with lots of brass. Bird cage with crows. You can never be too ready for Halloween. My honey came with me this Sunday to help me unload and set up. It is wonderful to have a partner who enjoys and supports this field. Makes the setup move quickly so you can enjoy working the display of items. After an hour setting things up, we headed back home but not before we decided on a late lunch. 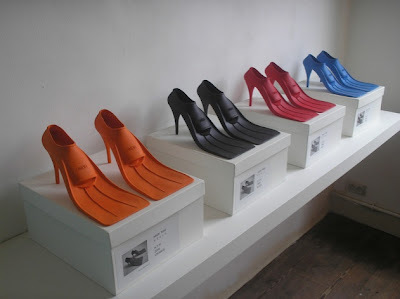 Okay, are these just not the perfect shoes for a water lovin, after the beach, go to the party with her dancing shoes on, and be ready for a midnight swim if it calls on pumps! These are soooooo Sea Witchy. I'd like a pair in basic black and lobster red, thank you. Practical, not in the least. Hilarious, oh you bet. If only they truly existed. Seems this was an art sculptural project and a couple of very clever students came up with this concept. Still, I would purchase a pair just for fun. I mean, how cool would it be to stroll up to a Bahamian tiki bar and restaurant sportin' these kicky shoes? My family loves to use nicknames and terms of endearment. I have been calling my granddaughter, Kaitlyn, my “three cheese ravioli” since she was born and it has become one of her favorite nicknames along with Kit Kat and Monkey. 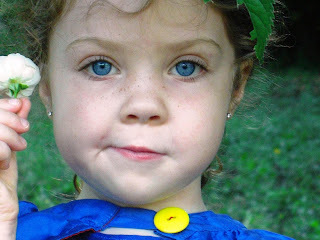 When she was 2 years old she even asked me why I call her a ravioli. Why, I told her that ravioli’s are “warm pockets of goodness” and that is what she was. She smiled and ran off to play. Kaitlyn wearing her Disney princess house dress and trying on her Aunt Renee's peep toe, leopard pattern pumps in the Bahamas. I was smiling and laughing so hard that I wanted to reach into that phone all the way to Italy and hug that hilarious child and smother her with kisses. Apparently, upon reaching the mature age of “4” this July, this was weighing quite heavily on her mind and she confided in mommy that she was 4 now and should be a 4-cheese rav instead of a 3-cheese rav. Mommy said ask grandma-ma and that is what she did. So when she is 16, will she let me call her my 16 cheese ravioli…we shall see! Heart cockles are such pretty shells. These heart shaped shells are strong, compact, and can be rolled over the sands and banged about without any damage to the mollusk living inside. Sounds a like lot the human heart which can take a lot, both physically and emotionally, and still continue to strongly beat on. The shell features are completely symmetrical and have equal sized valves giving it the apearance of a perfect heart, which makes this such a popular shell to find. They can be the purest of white or tan stripped. Cockles, like scallops, are filter feeders and act as little Brita filters for the environment as well. Let us also not forget this lovely idiom in our language “warms the cockles of my heart.” Yes, the emotion or feeling of warming one’s innermost being. This expression turns up first in the middle of the seventeenth century, and that the earliest form of the idiom was "rejoice the cockles of one’s heart. " Did this have its origins in the shape or what is contained inside the shell? Who knows. I just know that cockles are a type of bivalve mollusk and were once a staple part of the diet for the coastal communities of the British Kingdom. Fat free and high in protein, the meat of the cockle will truly warm your heart. My honey said, there is a box on the counter for you. It came in the mail today. I wasn't expecting anything, but WAIT! Could it be, I think it may be....YES YES YES, my Pay It Forward from Ana of "A Petite Cottage (http://apetitecottage.blogspot.com/). I'm feeling like a Sea Witch at Christmas and can't wait to open the box, but I must grab my camera and take photos as this is part of the Pay It Forward rules. A box with bubble wrapped items and a pink envelope. A lovely note from Ana and she says, "That upon visiting and looking through your blog, it became very very clear that you love the sea." So it is with this in mind that she created the two wonderful items just for me! A bubble wrapped package and pretty wrapped package. Which do I open first? 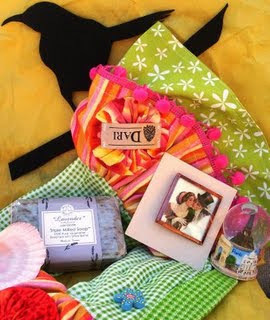 I decide to open the pretty wrapped package first and inside was a sweet door hanger that Ana had created just for me. My blog name and a seahorse in Caribbean waters blue and green. I adore Seahorses, Sea dragons and jellies (jelly fish) so this pretty little door hanger is a wonderful gift for a Sea Witch. I think I will bring it to our little sailboat in the Bahamas and put it on the berth door. The gift every Sea Witch would adore. Ana had created a miniature cloche display of sea shells and seaweed. No more than 4 inches high and 3 inches wide, she has re purposed a vintage china saucer and inverted a glass rose bowl. Tricked out with a pretty crocheted base and top. I have nothing like this in my collection of shells so this is very dear to my heart. 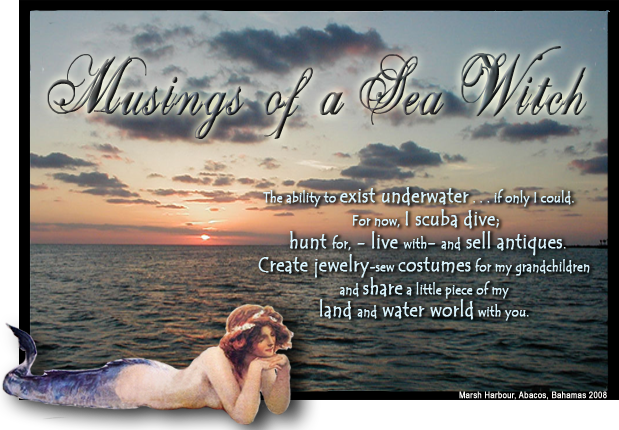 Thank you Ana for creating something special just for me that reflects my love for the sea. You are insightful and talented. Now, if you would like to participate in the Pay It Forward Project, just leave a comment about this posting. The first three posters will be my next Pay It Forward recipients. Remember, you must have a blog so I can read postings to learn a little about you. This way I will know what to create just for you. Be sure to include your email address so I can contact you just before I am ready to ship your package. Upon receipt of your package post pics of what your received, add the Pay It Forward button below and wait for three comments and you too can be a part of the Pay It Forward project. Just a glimpse of what I sent to one my recipients of my last Pay It Forward. Have a wonderful day everyone and be kind to each other. I adore cameos. They are miniature works of art that transforms the wearer in to a living art gallery. The art of cameo carving has been traced as far back as the second and first centuries B.C., to the ancient Greco-Roman empires, where cameos enjoyed a golden age. Stone, shell, lava, Bakelite, resin plastics and wood, they can be carved in relief, intaglio or molded. Napoleon was so taken by the beauty of cameos that he not only wore and collected them, he also started a school in Paris to train young carvers. His wife’s coronation crown was studded with cameos. Cameo jewelry was incredibly popular during the Victorian era, approximately 1837 - 1901. As one of Queen Elizabeth's favorite types of jewelry, the popularity of the cameo naturally coincides with her reign. This era is also when the profile, rather than other designs became the most popular style for cameos. This deep relief, angel skin cameo is also highly detailed with grapes and grape leaves in her hair and a strand of pearls at her neck. Angel skin is not a shell but a pale pink coral and is one of the most sought after most expensive shell cameo types. I have two cameos that I wear often, one belonged to my grandma-nana and is a traditional Rebecca at the Well theme (1890s). This was a widely popular cameo, often purchased for cash or trade from a traveling salesman across the prairies and the American West by working class men and women. Other than the wedding band a woman may own, it was the cameo to be worn at her throat that women covented. My other cameo is also a traditional Rebecca at the Well but contains two animals, a horse and a dog. Her arms wrapped around the horse as he is drinking from the well with the dog drinking at her feet. I adore this piece because it shows a tenderness towards God's creatures. Although there is a repair, it is my favorite and I wear it often. Owned by the Sea Witch and worn often (1890s). Cameos and cameo jewelry are treasures meant to be passed on from one generation to another. Cameos require special care and cleaning to keep them as beautiful as when first acquired and especially old cameo pieces. Shell and coral cameos in particular need a beauty regimen as they are prone to discoloration and cracking from drying as they age. To prevent the color-change and discoloration they need to be moisturized a couple of times of year with baby or mineral oil. 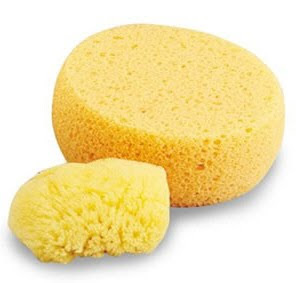 Just apply the oil with your finger or soft-cotton swab and let it sit overnight. In the morning, wipe any remaining oil from the cameo with a soft fabric cloth--DO NOT use a paper towel. DO NOT wash the excess oil off or the moisturizing effect of the oil will be washed away also. Moisturize or rehydrate your cameos twice or year and each time after cleaning them. If your cameo needs cleaning, use a jewelry cleaner that is safe for cleaning pearls. Pearls, coral and shells are all porous materials so your cleaner must be gentle or it will destroy the cameo. It was time for a change so I have switched my header out to a photo I took while snorkeling at Green Turtle Key in the Bahamas two years ago. Marvelous little reef area just a few steps from our hotel room. The water was crystal clear and you could see hundreds of these Bahamian Sea Stars and sea urchins laying on the sand beds. This particular sea star was slowly moving towards the sea urchin to make it a meal. Sea Stars are not really fish, they are an echinoderm (from the Greek, meaning spiney skin) and it is related to the sand dollar. They exist exclusively in the sea and cannot be found in fresh water or on land. Most sea stars, like the Bahamian Sea Star, (also known as the Cushion Star) have five arms and can live up to 35 years, although I have seen them with 6 arms and one with 4 that looked like a cross. They are an aggressive predator under the sea, hunting mollusks and other echinoderms. Sea Stars turn their stomachs inside out to eat, which it wraps completely around its prey, until the prey is digested. I am always amazed at the size of these creatures and although the photo does not show scale, the sea urchin is the size of a large grapefruit and the sea star was over 12 inches in diameter. 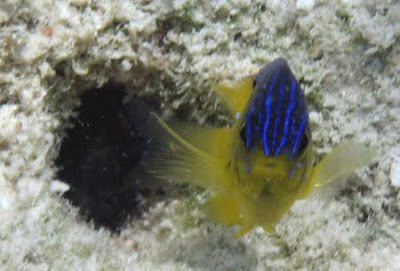 I spent all afternoon snorkeling and looking at the hundreds of sea stars, sea urchins and little fish that lived there. This little guy kept popping in and out of this burrow to say hello. and the show my sister and I have been waiting for will be on television tonight. YES, after a long absence, Project Runway is BACK with its 6th season (Lifetime) and I'm beside myself. I adore this show for its creativity, its challenges, the hilarious personalities, the trips to Mood Fabrics, and of course, the classy Tim Gunn and Heidi Klum. Tim's "Make it Work" has become a personal mantra for so many things in my life, both good and bad. Three simple words that speak so much. 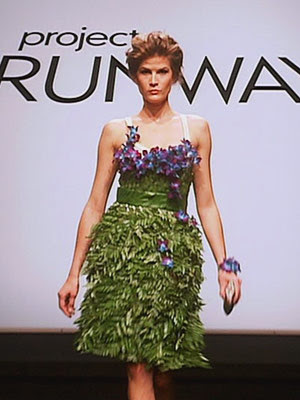 I hope they bring back one of my personal challenge favorites...utilizing only natural materials purchased from the New York flower district to create and design a wearable outfit. 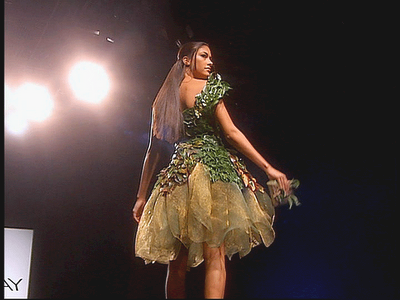 The designers really have to pull out all of the stops to construct a wearable outfit made completely of natural flora. Amazing some of these finished creations. So, tonight at 9:00 pm, EST I will have my beautiful buns sitting on the sofa, a cup of freshly brewed tea in a cup and the dog at my feet as I watch the opening episode to Season 6 of Project Runway. Who knows, I may come up with a few new ideas for a princess gown in princess colors for my granddaughter. Let the challenges begin and let's "Make it Work!" ps. I just realized this is my 50th post! whoo hooooo! I'm loving this variation on White Wednesday. Thank you, Anything Goes Here at http://thepottingshed-anythinggoeshere.blogspot.com/, for starting this white shell Wednesday. I have been collecting shells as long as early childhood days. My first memories are of the sea shore and bringing home bits of sea shore treasures such as sea glass, shells, bottles of sand and anything else that may have looked interesting. I still have boxes of shells (and fossils and arrowheads and assorted rocks and minerals) from my childhood and seem to be ever adding to them as an adult. These gifts from the mother ocean have provided us with a legacy of both food, medicine and currency, but also the sacred. 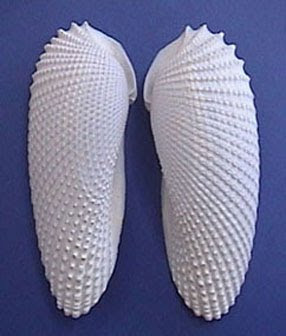 One of my favorite shells is the bivalve - Angel Wings. 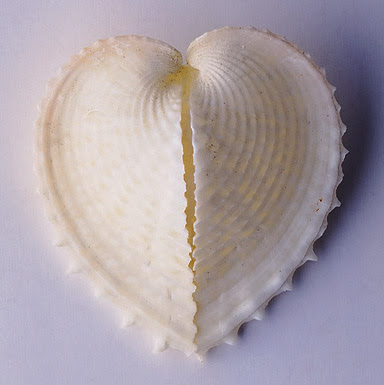 One cannot deny the existence of God our Creator and his angels as He so lovingly bestowed their existence in the shape of this lowly little clam shell. 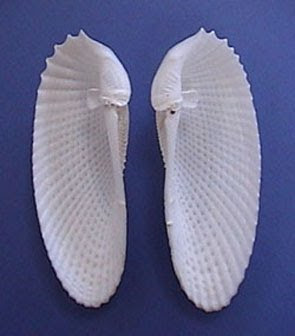 Delicate and the purest of white, I have gathered angel wing shells from the sea shores in Sanibel Island and in the Carolina's. As I was strolling through one of my favorite antique malls, this past Sunday, I receive a call from my 4 year old granddaughter. She was calling me from her home in Vincenza, Italy to tell Grandma-ma that, and I quote, "Grandma-ma, you know I have been dreaming of a Jasmine princess gown in pink and purple." Kaitlyn in her Snow White oufit with sweet little freckles across her nose. How can you not laugh at this? A 4-year old is dreaming of a princess gown in pink and purple and knew that if she called grandma-ma in Georgia and shared that dream, then grandma-ma would run out and purchase princess fabric and whip up a gown. And that is exactly how it unfolded, but not before this conversational exchange. "Kaitlyn, since Jasmine is a harem princess, would you like grandma-ma to make princess harem pants and top and then a pretty princess skirt to wear over it?" "No, NO, grandma-ma. This must be a princess gown and it must be in princess colors. You know, pink and purple." (hey, I raised sons, what do I know of princess colors?) Okay, so I have rich, aqua blue colors in my head with gold and rhinestone accents, pastel veils abound with perhaps bells for her ankles. By crashing waves, she has been dreaming of a Jasmine princess gown in pink and purple and no matter what grandma-ma suggests, only pink and purple will fit her dream. So I folded like a cheap suit and told her that I would pick up pink and purple princess fabric and begin to create her princess gown. I looked at different Disney animation cells of Jasmine and finalized a sketch and now it is off to create...after all, I was handed my marching orders by my granddaughter. As my sister said, nothing like being given a Project Runway gown challenge by a 4 year old. Of course, this love for costumes is shamelessly all my fault. I have designed and created costumes for my sons throughout their childhood and it only seemed natural to pick up the costume gauntlet with my granddaughter. This and about 200 vintage hats in my house and she was gonna be into costume and imagination play at a very early age as these picture show. Below are pictures of my granddaughter and a few of the costumes I have made for her. I think she looks adorable in my vintage hats too. My grandma-ma dressed me like a Katydid for Halloween when I was 4 months old. Just because one of my many nicknames is little Katydid doesn't mean I should dress up like a bug. 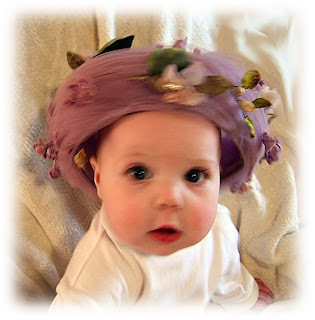 A nice lilac and flowers church hat for me. 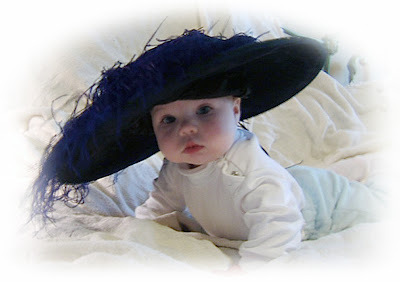 I come to stay with Grandma-ma and Grampy so mommy and daddy can have some time alone and all grandma-ma did was dress me up in her vintage hats. Although, I must say, this antique Edwardian hat is quite lovely. I'm a mermaid princess and I have a real mermaid tail. I would make daddy carry me all around the house, to the supper table, to the bathroom and to my bed at night because a mermaid cannot walk with a tail. I'm making a fishy face with my pretty head piece and blue hair extensions. 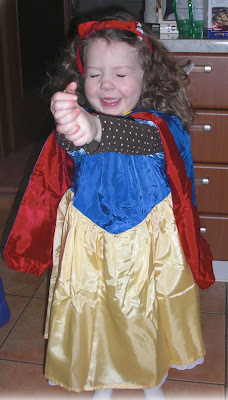 a snow white princess dress. Mommy says that I squealed with delight when I received this princess costume. Grandma-ma even made a petticoat underneath just like Snow White. This is not a poison apple but mommy says I must take a nap after lunch anyway. So, I'm knee deep in pink and purple fabric as I create a Jasmine princess gown for my sweet little ravioli. I will post pictures of her dressed as Jasmine when I receive them...the seamstress Sea Witch. 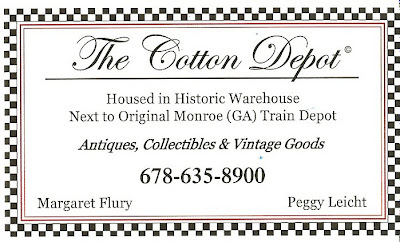 A gal pal of mine is acquiring a booth at the Cotton Depot in Monroe, GA so I had to make a road trip down that way to check the venue out. So my honey and I headed out to Monroe this past Saturday afternoon. It was a gentle drive of about 55 minutes from Lawrenceville and it was fun meandering over state roads. Monroe is typical of agricultural communities who have kept the charm of their now revitalized community and have converted many of its commercial agricultural industry buildings into other commercial endeavors. My favorite is the paintball indoor arena that was once a cotton processing facility. What a great place for a family or "big boys" outing ( http://www.monroepaintballworks.com/ ) and an excellent reuse of an abandoned property. My honey standing in front of the Cotton Depot. Loving this building and I can't wait to see what treasures are inside. We are both greeted by two delightful women, Margaret and Peggy and within minutes we were all laughing and sharing stories like old friends. If these ladies are representative of what can be found inside, then I knew we hit antique shop pay dirt. As far as the eye can see, two aisles of booths filled with treasure. Old bales of cotton can be found throughout the building. I love this kind of thing and my honey, a Boston native, said this was the first actual cotton bale he had ever seen up close and personal. It is amazing to see how tightly they packed the cotton into the bale and it is huge. This leopard car coat is the bomb! I almost went home with it but it didn't fit, sigh. Red is such a happy color for the kitchen. A couple bottles of Coca Cola on the table and you have a great day going. Love the amusing look of this deer and his hat! What fun you can have decorating all season long with this taxidermy piece. From the same booth that Waldo the deer was in, this dealer had really nifty things. So many things to select from. Lovely shabby french pieces and at a take away price. Fell in love with these diner stools. If I still had my old farm kitchen from Illinois, I would have put these in it. White, white, and more white. Always a popular decorating choice. Sweet little embroidery in original frame from the 1970s. Crazy about this old ice box. This one is a biggie and in wonderful condition. Would make a fun bar for entertaining. Who could resist these adorable 60's pups. Great price too! The brick wall is a lovely backdrop throughout the building and it really enhances the furniture the dealers have to offer. Wonderful kitchen cupboard with original paint. Had to have a photo of these hand painted seat cushions of mermaids. After all, I am a Sea Witch! These are designed and painted by a local woman in her 80's. God bless her. I did not walk away from The Cotton Depot empty handed. Found a shell covered box that I had to take home but also acquired a marvelous school bell from the late 1800s. Delightful ring and original patina...I am loving this little bell from one room schoolhouse days past. We said goodbye to our new friends, Margaret and Peggy and are plannning a return trip to this lovely antique shop over the Christmas holidays. I can already smell the hot apple cider and see the trays of holiday cookies as I walk these aisles again. This beautiful building is going to look amazing dressed in its finest holiday trappings. We decided to conclude this delightful road trip at our local Mellow Mushroom eatery with a tall, cold one for my honey and a pizza pie. Fresh mushrooms, pepperoni and sweet sausage and life is wonderful. We can never finish a Mellow Mush pie so we brought home remaining slices for later and of course, "pizza bones" for the dog. What are pizza bones you say? Well, those are the left over crusts that get uneaten. Kota adores them and he knows when we walk through the house with a pizza pie box in our hands, then their are pizza bones to be had. I do hope you can visit the Cotton Depot one day. It is a lovely place to shop for vintage and antique items. It's monday but I'm still feeling Friday. Feeling the Blues of Flow Blue.